sister projects: Wikipedia article, Commons gallery, Commons category, definition, textbook, course. Meteorology is the interdisciplinary scientific study of the atmosphere. Studies in the field stretch back millennia, though significant progress in meteorology did not occur until the eighteenth century. The nineteenth century saw breakthroughs occur after observing networks developed across several countries. 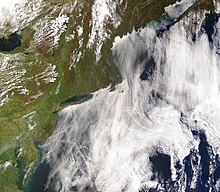 Breakthroughs in weather forecasting were achieved in the latter half of the twentieth century, after the development of the computer.— Excerpted from Meteorology on Wikipedia, the free encyclopedia. "The Storm-Wave in Bengal" in Littell's Living Age, 132 (1702) January 27, 1877.